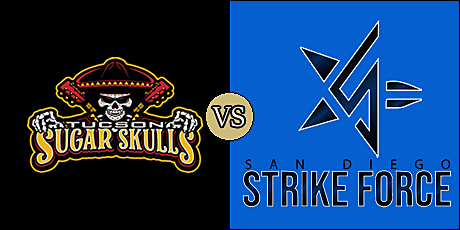 WEEK 2 RECAP: Sugar Skulls claim first "Expansion Bowl"
SAN DIEGO, CA - In a battle of the Indoor Football League's 2019 expansion teams, the Tucson Sugar Skulls opened up a three-score lead in the third quarter, and held on to top the San Diego Strike force tonight at Pechanga Arena San Diego. It was the season opener for the Sugar Skulls, who had a bye in week 1. Tucson stands at 1-0 on the young season. The Strike Force, who fell to the Steamwheelers at Quad City last week, fell to 2-2. The game was the first in what SCtoC has dubbed the Expansion Bowl series between the teams. It's also the first of four meetings between the geographically close teams. Tucson held a slim 14-10 lead at the end of the first quarter and extended that to 25-24 at intermission. The Sugar Skulls led 49-37 after three quarters before outscoring the Strike force 16-7 to provide the final margin of victory. Wide receiver Shaq Curenton and running back Mike Jones each scored three touchdowns for the Sugar Skulls in the win. The official stats and scoring were unavailable at the time of this writing. This article will be updated once that information becomes available. The Strike Force head to Cedar Rapids to meet the River Kings on March 9 with kickoff scheduled for 5:05 p.m. The Sugar Skulls have their home opener on March 10 against the Bismarck Bucks. Kickoff there is set for 3 p.m. All times are pacific standard time.